9 March, 2017, New Delhi: There has been much unrest amongst the consumers after some private banks announced charges on withdrawal and deposit of cash beyond a certain limit. 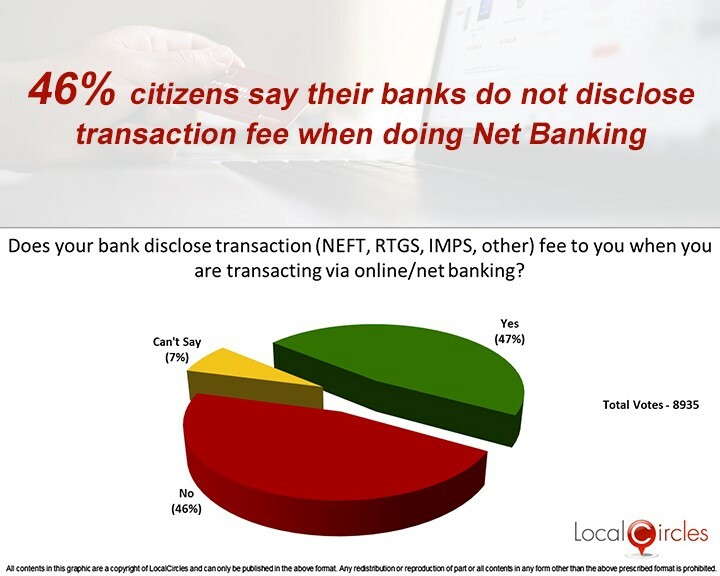 Citizen engagement platform LocalCircles took the discussion to the next level and asked the citizens if their bank discloses the transaction fee charged to them when they were making online transactions like NEFT, RTGS etc. and 46% citizens answered in a negative. 47% citizens said that they were aware of the transaction fee and 7% were unsure about it. A total of 8935 citizens participated in this survey. There have also been many cases where the consumer has complained of being charged by the bank without any intimation. 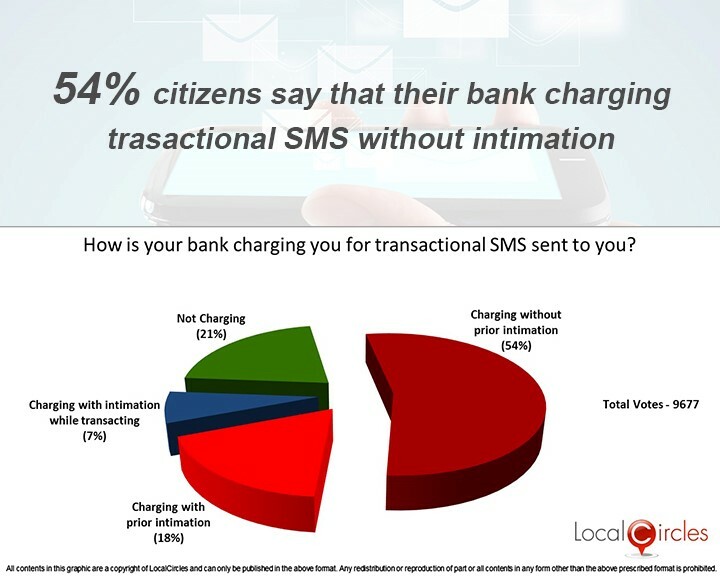 In a related survey, when asked how was their bank charging them for the transactional SMSs sent to them, 54% said that they were charged without prior intimation. In the poll which gathered 9677 responses, 18% said that they were charged with prior intimation, 7% said that they were charged with intimation while transacting and only 21% said that their bank was not charging them at all. Some other instances where banks charged customers without disclosure where also pointed out by the citizens. These included debit card charges without prior information, a service charge being charged on online transactions, customer account being debited every quarter under ‘preferred customer account’ head etc. 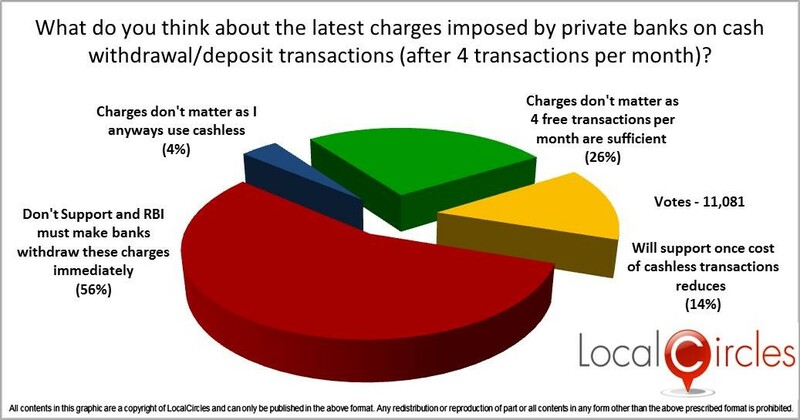 In the third survey conducted to understand the consumer view on the latest charges imposes by private banks on cash whithdrawals and deposits after the first 4 transactions every month, a large 56% said that they did not support this move and want Reserve Bank of India to make the banks withdraw these charges immediately. 26% said that these charges don’t matter as 4 free transactions were enough for them and 4% said that they were anyways using cashless. 14% said that they will support this move only once the cost of cashless transactions were reduced. So, overall 70% consumers are against the move while the remaining 30% are ok with it. A total of 11,081 citizens voted on this poll. Many citizens also said that these charges will force them to close their accounts with these private banks and migrate to bigger public sector banks. Consumers are of the opinion that instead of reducing the cost of digital transactions, private banks are trying to show the stick to the customer and forcing them to go digital. 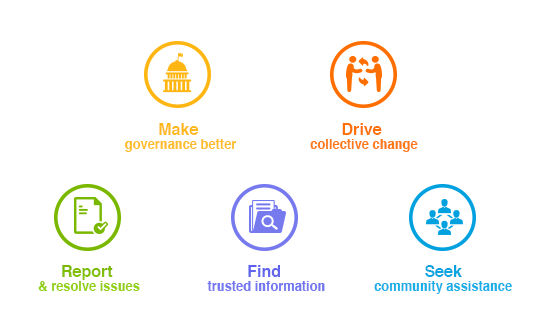 LocalCircles is sharing these consumer concerns with the Department of Consumer Affairs requesting them to take the matter up with banks directly and via other stakeholders in the Government.